"Music for the Massive" is modern heavy rock in the vein of Foo Fighters and (somewhat surprisingly) the more recent albums of Slipknot ("Vol. III: The Subliminal Verses") and Mushroomhead ("XIII"). In other words, there's plenty of alternative-twinged solid rock here but nothing too extreme. Still, for those who like things just a little different, "Music for the Massive" might be just what you're looking for. The band's real strength may be in taking funky, groove rhythms and loading them up with crushing guitar and pummeling drum and basslines. Sometimes, it seems that you've just decided you don't like a song when it suddenly kicks into gear and, hey, that ain't so bad! Perhaps too alternative-sounding for some, "Music for the Massive" is certainly different enough to warrant a listen. Different doesn't automatically make it good, of course, but there's a lot of talent at work here and the result is at least partially successful. Apartment 26: Terrence "Biff" Butler - vocals; John Greasley - guitars; Louis Macan - bass; Andy Huckvale - pianos, keyboards and programming; Brad Booker - drums. For more information, check out www.apartment26.com. "Within," a five track demo from England's Apartment 26, is a translucent glimpse into the future of electronic metal. Along with the likes of Gravity Kills, Pitchshifter, and Monster Voodoo Machine this demo finds Apartment 26 mining the creative amalgam of heavy guitars and electronic beats with great success. The song "Apt. 26" initially reminded me of Drown; however, as the band's first song in their current incarnation there is a strong feeling of something special brewing in the collective minds of the four members. "Dystopia" contains a bit too much electronica for my tastes, but is a frantic yet buoyant blast of energy. "slicedbeats" takes the electronica bit even further but in a more percussive, sharper edge. "Random Thinking" returns to the band to more gothic style, alternating between smooth vocal passages and fierce pulsating beats. "Question Of Reality" introduces a more rap-metal mix to the sound with fuzzy production, but also demonstrates the band's obvious potential in the hybrid world of metal and electronics. Lyrically, the band is intentionally ambiguous. Biff's vocal delivery is varied enough from track to track as well as within in each track to keep the listener interested. "Within" was produced by Doug Firley (who has co-produced Gravity Kills). Overall the production could have been a little better (especially the vocals which could have been a bit more upfront in the mix), but it's a demo so we've got to cut some slack. 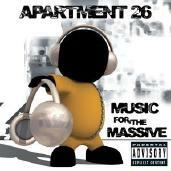 In the end, however, the disc does a great job at conveying the musical vision of Apartment 26. These young musicians definitely have a good road ahead of them if they stick to making music that is vibrant and pushes the envelope of the future of metal. Apartment 26 is currently writing for their full-length debut - be on the lookout for fresh metal coming your way soon. Apartment 26 is comprised of Biff on vocals, A.C. Huckvale handles the keyboards and programming, Jon Greasley is the guitarist, and Louis Cruden is the bassist. 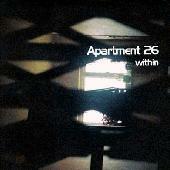 Visit the band's official homepage http://www.apartment26.com/Welcome.html for more information and to purchase the demo.